It's the words '...and how they worked' in the title that should convince you to get this book. As Taraba reveals in his Intro the forty-one articles originally appeared in 'Step-by-step graphics' magazine. The copy is basically unchanged though another fifty illustrations have been added to those that appeared in the magazine. 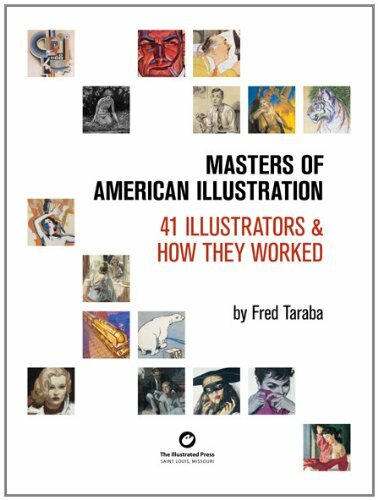 This is wonderful collection of illustrators, their work and nicely, looking back historically to some work produced before 1900. In fact there are plenty of artists from the distant past I was not too familiar with. What I think makes this book a cut above the rest is the way extra material has been included. So, not just a copy of a particular piece of art but frequently a rough sketch or model shots that helped the artist get it right. The cherry on top of the cake for me was showing how the art appeared in print. There are magazine spreads with the headlines and text, complete ads, magazine covers plus the logo and headlines. All this gives many of the images extra credence rather than just a picture of a painting divorced from why and where it was commissioned. A fabulous book and I wonder if they'll a second volume? There surely must be another forty-one artists and their working methods whose work needs exposure. If there is another book I would like to suggest that a slightly thinner paper is used. Apart from that I thought this was a five star plus book.